PALM BEACH, Fla. – March 12, 2018 – Barrett-Jackson, The World’s Greatest Collector Car Auctions®, is filling its docket with fully restored American GM muscle cars for its 16th Annual Palm Beach Auction April 12-15, 2018 at the South Florida Fairgrounds. Highlighting the American muscle cars are a rare ’69 Pontiac GTO Judge Ram Air IV (Lot #708.1) at No Reserve, one of only 549 Judges with the Ram Air IV engine option, and a ’74 Pontiac Trans Am 455 Super Duty (Lot #699) also offered at No Reserve, that is one of only 943 built. 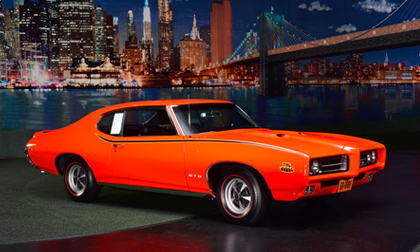 Restored and rare GM muscle cars that will cross the Palm Beach Auction block at No Reserve include a ’70 GTO Convertible (Lot #698.1), which underwent a body-off restoration in 2016 and is one of only 241 GTO convertibles from that year equipped with 455ci engine and 3-speed automatic transmission. One of the most well-documented 442 convertibles in the country, a ’71 Oldsmobile 442 (Lot #697.1) has been fully restored to exact factory specifications with great attention to detail. Also crossing the block is a Montero Red ’66 Pontiac GTO (Lot #648) that recently underwent a nut-and-bolt restoration with all-original sheet metal. Other anticipated GM muscle cars making their way to Palm Beach at No Reserve include a ’69 Chevrolet Camaro Z/28 RS (Lot #418.1), which has less than 1,000 miles since its restoration and features the original LeMans Blue paint code with white stripes, 302ci engine and 4-speed manual transmission. A Milano Maroon ’66 Chevrolet Corvette 427/390 (Lot #649) is equipped with factory air conditioning, beautiful black vinyl interior, teakwood sport steering wheel and AM/FM radio with power antenna.